I thought the long term value analysis of Ethereum by Pitchbook was excellent. Below are some of the points that I found to be most salient (link to the full analysis at the end of the article). We are not entirely convinced the Medium of Exchange (m=pq/v) theory is an appropriate representation of new and young digital economies like Ethereum, so it is possible value accumulation will be driven by different factors. However, we do believe the nature of the Ethereum economy will lead to miners capturing a much greater portion of value than token holders. This is likely driven by the shift to PoS, which dramatically lowers the cost to maintain the network, as well as leads to greater token velocity when a growing number of dapps pay more transaction fees associated with computational processes on the network. end result of a complete PoS-based protocol. The protocol allows for pseudonymous privacy but not complete anonymity due to the ability to track activity across addresses. Purpose: Ether serves as the medium of exchange for dapp developers (i.e., end-users who pay for the computational power used by their applications). Conversely, Ether acts as the nancial incentive for miners to uphold the network because miners earn newly minted tokens and transaction fees for every group of transactions they verify and add to the blockchain. 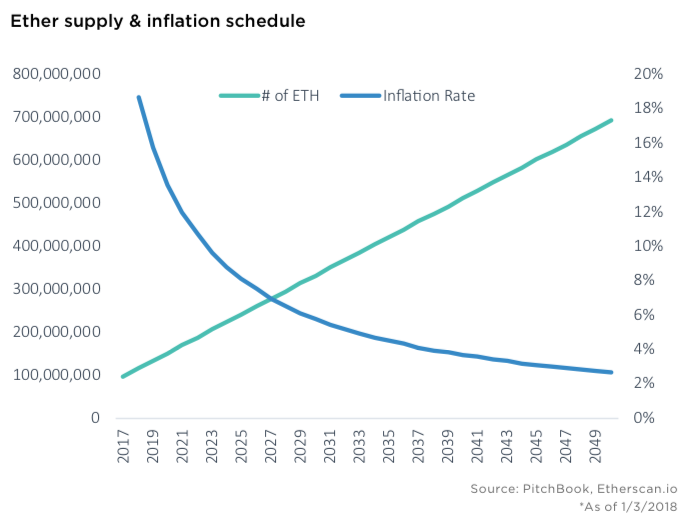 Inflation Schedule: Capped at a maximum of 18 million new Ether per year. Previous Previous post: Is online age verification for adult content delayed in the UK?